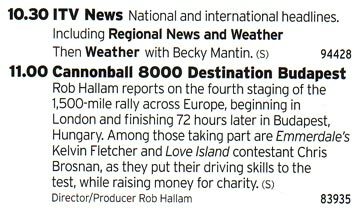 …but the reason for purchasing one this particular week is because if you turn to page 94 and look at the ITV1 schedule for Tuesday 28th November, there’s a listing for the Cannonball show – woo! They’ve actually done a pretty decent write-up in there as well. 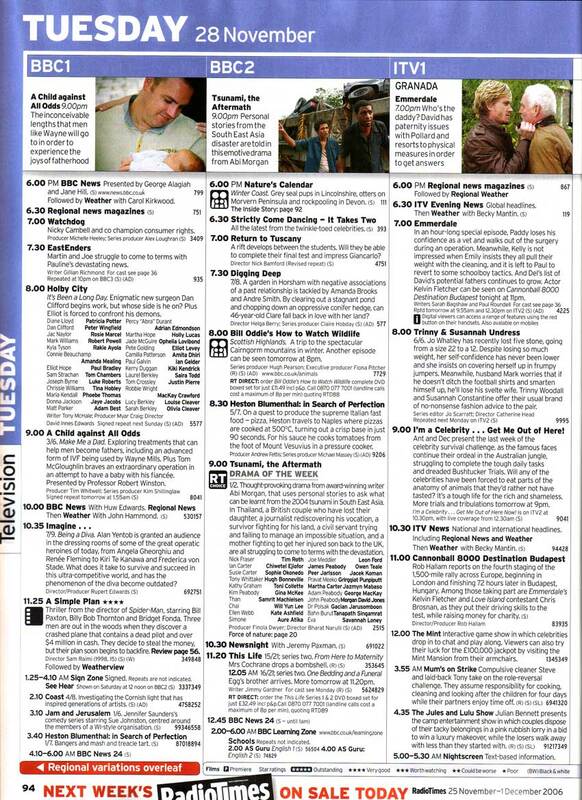 Rob originally wrote some copy to send out to the listings magazines, but often stuff like that is edited right down to the bare minimum, but I think the show looks quite prominent here. Hopefully it will get lots of viewers because there’s not that much up against it really. We’re going to be watching it at the Sports Bar in town with the rest of the crew, and some of the guys who appear in it. It’ll be quite weird because it feels like I know a lot of them having watched them solidly on it for the last few weeks! Just thought I’d do a quick catch up blog because I’ve not posted since my birthday last month. It’s been really busy this last few weeks… in the last 14 days I’ve worked 128 hours, and I’m about to go out and do some filming for Channel M tonight which means I’ll probably be working until about midnight! I’m actually the busiest I’ve been so far… due to deadlines and stuff I managed to do a 36 hour day this week! I got up at 8am on Sunday to start work for 9, then worked straight through until 7pm on Monday night – finally getting to sleep about 8pm… I reckon Monday was probably the worst day of editing I’ve ever done! I went to see Delirious at the Apollo on the Friday after my birthday, and it was excellent! I went with Sa, and we met Caroline and Colin beforehand, and I also bumped into a few people I hadn’t seen in quite a while. Tim Hughes opened the gig, and although he was potentially an odd choice for a support act, he went down really well with the crowd. Then Delirious came on, and they played mostly stuff off Mission Bell, but did throw some older stuff into the mix as well. It was a great gig – and they made extensive use of visuals as well, although at times I did find them a bit distracting, but that could have been because I was thinking how I’d have done a couple of them better! I just can’t switch off! 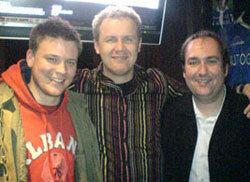 Then last night I met up with Craig who I used to work with at MUTV, and who left to work at the CITV channel around the same time I went freelance. He’s just found out he’s being made redundant so wanted to meet up to ask about going freelance and stuff. Not sure if I was any help really, but it was cool to catch up!